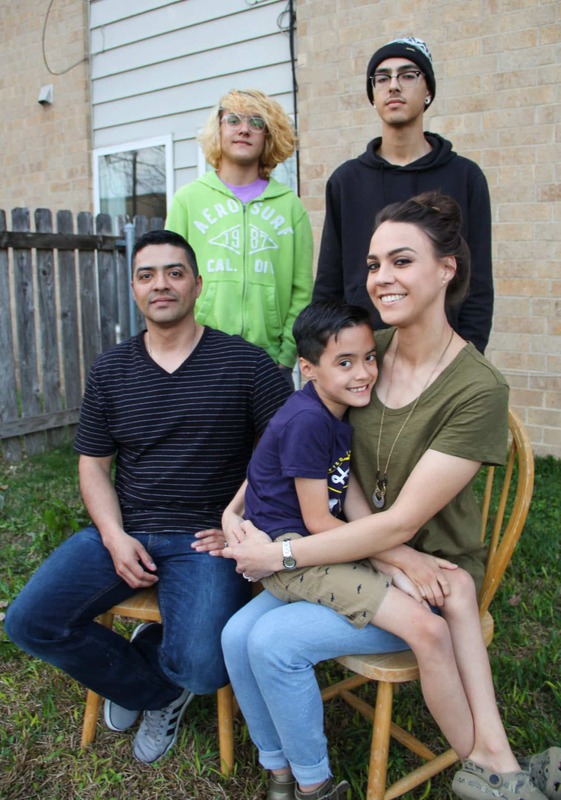 When their four nieces needed a safe place to stay, Killeen couple Agustin and Amber opened their home even though they already had three sons, Kaleb, 18, Marcus, 14, and Shyloh, 7. 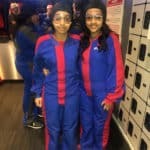 The girls had experienced a tough life in their short years and the couple was ready and willing to show them compassion and love for as long as they needed it. The court placed the girls, ages 3, 7, 9 and 11 in their care in June 2017. 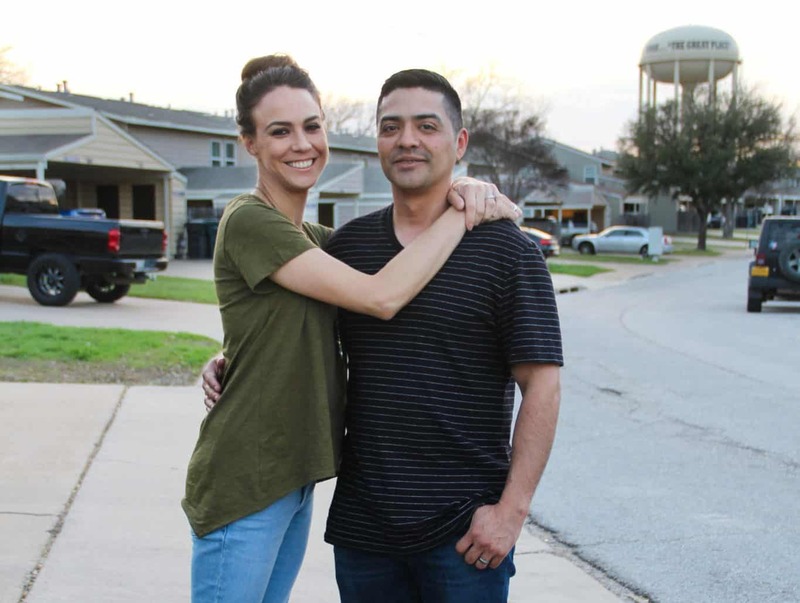 The day after the girls moved into their home, Agustin was deployed overseas with the United States Army, leaving Amber to care for seven children by herself. Every day thousands of families like Agustin and Amber are making personal sacrifices in service of others. They are a military family; part of a heroic community of soldiers, spouses, children and loved ones who face these unique challenges out of devotion to our great nation. According to Moe Dozier, vice president for programs at Methodist Children’s Home, MCH has an initiative to meet the needs of its communities and recognizes there is a significant military presence in several communities it serves. “We want to give back to those families who give so much to us, and serve those who serve us,” Dozier said. Currently, MCH Family Outreach offices offer programs designed to support families through case management, parent education, and early intervention and preventative services. The offices in Abilene, Albuquerque, El Paso, San Antonio, and, most recently, Killeen are all located near military bases. Traci Wagner, program administrator for the Eastern region of MCH Family Outreach, believes these programs could be beneficial for military or veteran families due to their demanding lifestyle. “With several offices situated near military bases, MCH has a unique opportunity to offer support services and walk alongside our nation’s heroic families,” Wagner said. “Military families sometimes face specific circumstances, including extended and repeated deployment and reintegration, that our client-centered and trauma-informed approach can help address. 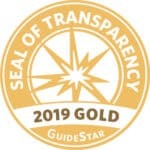 “We want to help military families, active and retired, identify strengths and set goals and offer hope to them as they navigate the challenges and celebrate the triumphs of life,” she continued. Agustin and Amber live at Fort Hood in Killeen, a city where MCH Family Outreach strategically opened an office in 2016. Fort Hood is one of the largest military bases in the United States with a supported population of more than 383,000*. Director of MCH Family Outreach in Killeen Violet Read and her team have been working diligently since the opening to build connections and find families who could benefit from MCH services. 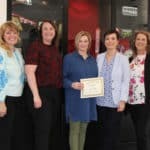 They have participated in community outreach events for military and veterans as well as joined local alliances such as the Veterans Service Alliance of Central Texas and the Ministry Servant Alliance at Fort Hood. The MCH team has also built relationships with the Texas Veterans Commission, Child and Family Behavioral Health Clinic at Carl R. Darnall Army Medical Center, and Operation Phantom Support, a local nonprofit that provides services for active-duty and honorably discharged veterans and their families. 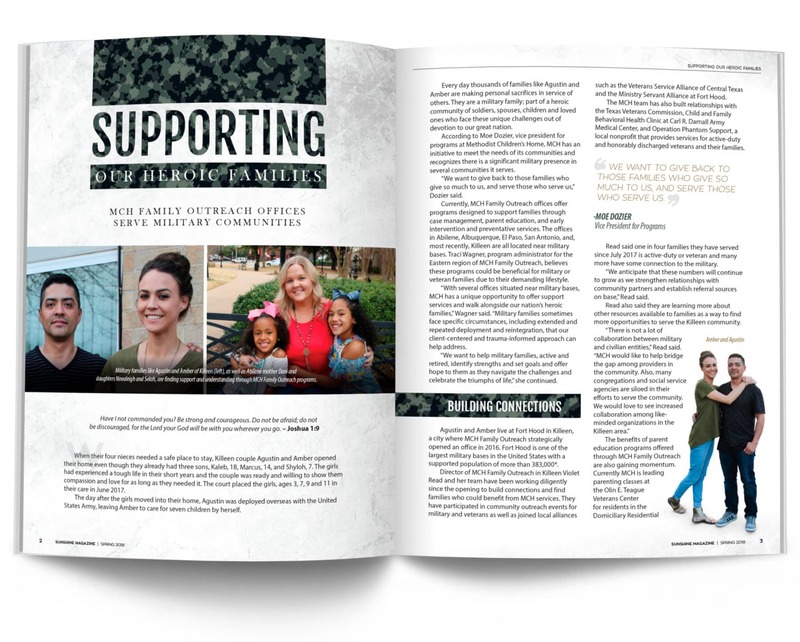 Read said one in four families they have served since July 2017 is active-duty or veteran and many more have some connection to the military. “We anticipate that these numbers will continue to grow as we strengthen relationships with community partners and establish referral sources on base,” Read said. 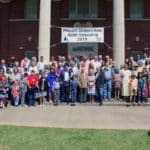 Read also said they are learning more about other resources available to families as a way to find more opportunities to serve the Killeen community. The benefits of parent education programs offered through MCH Family Outreach are also gaining momentum. Currently MCH is leading parenting classes at the Olin E. Teague Veterans Center for residents in the Domiciliary Residential Rehabilitation Treatment Program. These classes include 8-10 veterans from all over the country and has been helpful for participants, according to LaMencia Hill, counselor and local recovery coordinator. She said she is appreciative of the investment MCH has shown in sharing trauma-informed curriculum for parents. 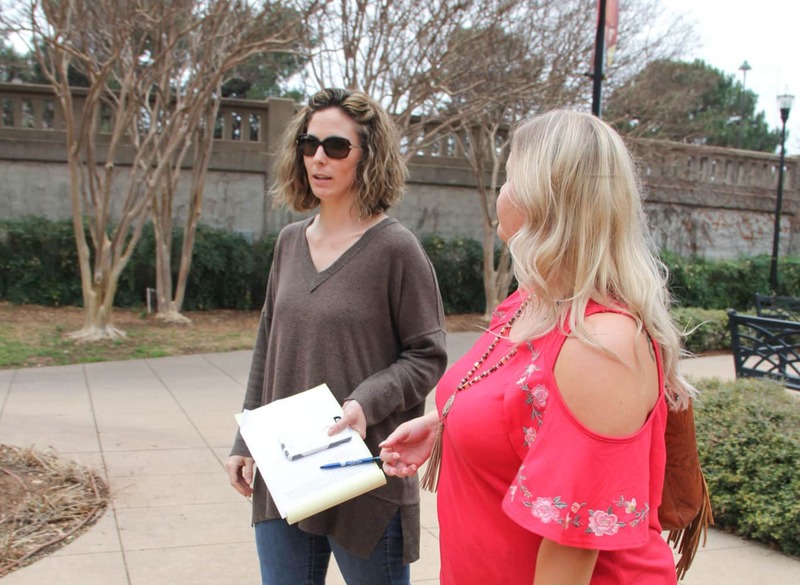 Nurses from New Parent Support, a service for military families at Fort Hood, attend parenting classes in order to gain knowledge for their clients. From left: Paula McMahan, Violet Read (MCH Family Outreach Director – Killeen), Lora Lamositele, Rosemarie Steffers and Jasmine Milledge. 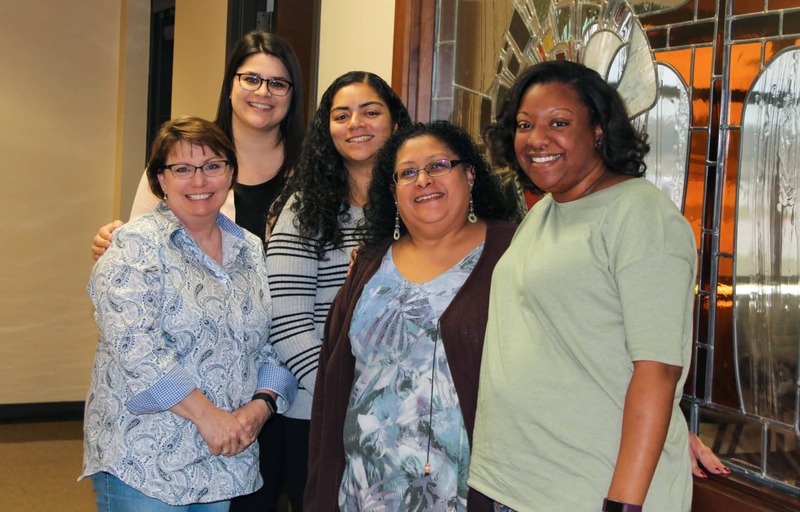 Several registered nurses from New Parent Support, a service provided at Fort Hood to new or expecting parents, attend MCH parenting classes taught at First United Methodist Church in Killeen in order to learn more about the curriculum. They said the material has been helpful for them both personally and professionally and foresee sharing it with clients. Also they will be able to refer to MCH families they are unable to serve due to their children aging out of their program or because a client may have concerns about using a government service, even though matters discussed remain confidential. MCH Family Outreach in Killeen has found that there is a space for them to serve military and veteran families. Amber and Agustin found MCH Family Outreach through a referral from a counseling service for one of the girls. Although this was Agustin’s third deployment, Amber said this time the growth in her family caused her to seek additional support. For Amber and Agustin, having their MCH case manager, Frankie Cones, there to support Amber during her husband’s deployment made a big impact. 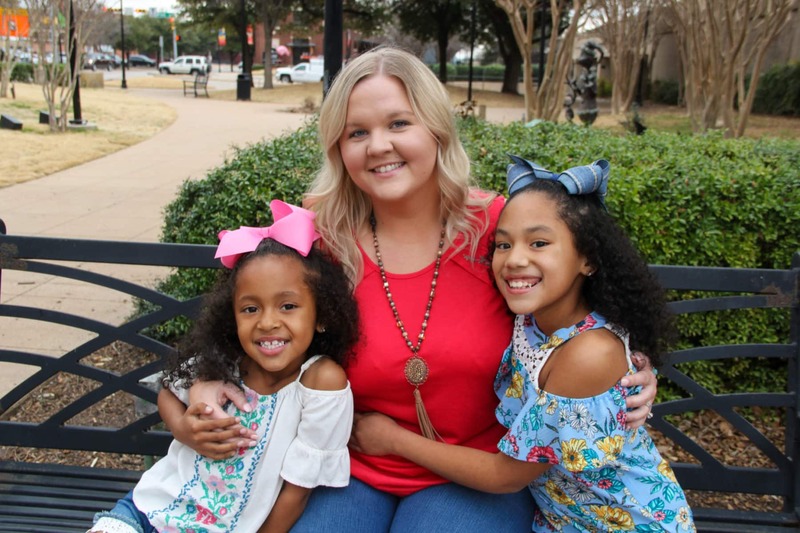 Cones was able to walk alongside Amber as she advocated for herself and her family through the child services system, where it was determined that the two youngest girls would need alternative placement. Cones was also able to help Amber understand that the behaviors she was seeing in the two older girls was the result of trauma they experienced. Cones shared new parenting ideas and approaches with Amber and led nurture group activities for the family that would help them better connect, bond and express their feelings. Additionally, Cones assisted Amber with finding movers when a larger home on post became available and she worked with Amber during the tedious process of obtaining birth certificates for the girls so that they would be eligible as military dependents to utilize special services for children on base. Agustin struggled with hearing his wife’s stress over the phone and felt limited in his ability to help due to being overseas. He said having Cones there to talk his wife through each challenge gave the family the support they needed during a difficult transition. Now back at home, he has seen firsthand the impact MCH has had on the family. The couple reported that the family is now doing well thanks to the support they received from MCH Family Outreach and the military community. Moving on post provided the girls with a feeling of security and stability. Now classified as military dependents, they have access to counselors, are making friends in the neighborhood, and are involved in after-school activities that build self-confidence. Read said she has learned that many military families like Agustin and Amber are very resilient and resourceful. Dani, a mother in Abilene, is counting down the days until her husband Brandon will return from his third deployment in three years. The couple met at age 17 and were engaged to be married a year-and-a-half later. Brandon signed on to serve in the U.S. Air Force and the couple felt it would give them a secure and comfortable life where Dani could be a stay-at-home mother. However, after attempts to have children failed, the couple decided to look into becoming foster parents with hopes of adoption. But they found understanding through MCH Family Outreach in Abilene when they met director Megan Harbin. Abilene is one of five MCH Family Outreach locations with a foster care program, along with Dallas, Houston, San Antonio, and Tyler. Although MCH is not licensed to facilitate adoptions, they have many foster children who need a safe home. Currently, Abilene has 12 licensed foster families with hopes of growing the program to 20 this year. Harbin said military families have many strengths that make them good foster parents. From left: Megan Harbin (MCH Family Outreach Director – Abilene) continues to be a source of support and encouragement to Dani and her family. Dani said fostering was tough at first and she had negative experiences with the first two placements. Even with all the training and counseling provided, Dani said she felt emotionally exhausted, especially when she had to return her foster child to its parent only days after her husband was deployed. After taking a break from fostering for about six months, the couple decided to try again. 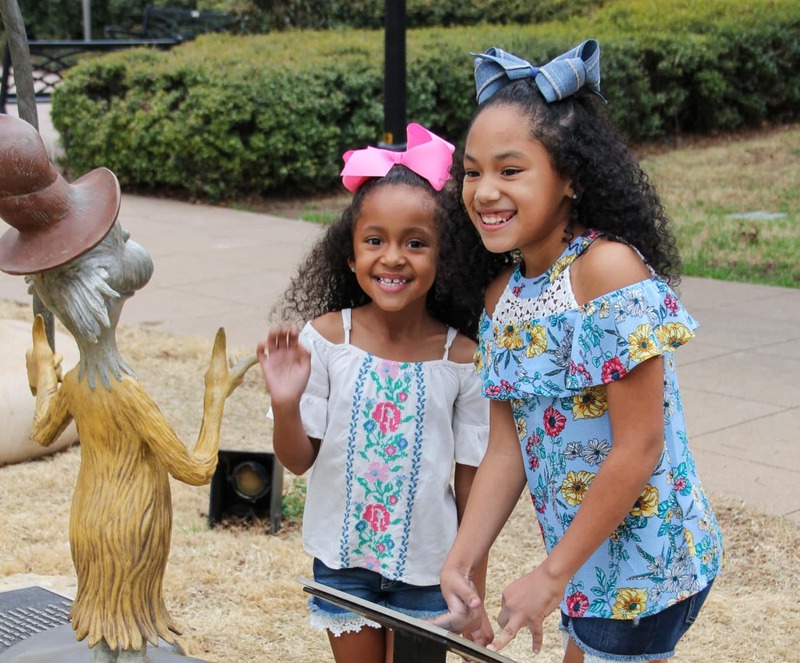 They fostered a little boy for a short time and then got the call about sisters Novaleigh, 7, and Selah, 8. The girls were placed in their home in April 2017 and the couple fell in love with them. Seven months later, they were able to adopt them through another agency. Dani said Harbin has supported them through the process and has a good understanding of military families. “I think our community is a strength,” Dani said. “Living on base is safe. There are guards at the gate, the kids know no one is going to show up at their house. Everything is very uniform and structured. They are around other children whose parents are deployed. Everything is very normal to them. Dani said the girls are handling Brandon’s absence well as they mark the dates off the calendar until he returns at the end of the summer. She is proud to be a military family and feels it better prepared her as a foster mother. *Supported population includes on-post population, soldiers deployed, employees, contractors, commissaries, and school personnel. Information provided by Fort Hood Fact Sheet, March 3, 2017.